Photos submitted by Zachary El-Fallah. Spain Park senior Zachary El-Fallah won the AHSAA boys’ state diving crown at Auburn University’s James E. Martin Aquatics Center on Nov. 30. He posted a final score of 396.50, enough to top the runner-up, eighth-grader Daniel Coffman of Huntsville, by 56.25 points. Two local seventh-graders made the top 10: Owen Fuller of Hoover at sixth place and Michael Helton of Vestavia Hills at 10th. El-Fallah has been a multi-sport athlete for the Jaguars since middle school. His career has been plagued by injuries that should have not just slowed him down; they should have stopped him. But he refused to quit. He broke the fifth lumbar in his back in eighth grade. He thinks that happened while wrestling, but it could have been gymnastics, diving or soccer, too. That year, he finished second in the state in diving. He tore his ACL during his sophomore soccer season, and his left knee has developed tendinitis compensating for the injured right one. Coaches have limited his activity, and his mom has trusted his judgment to stop when he’s in too much pain. So he’s paced himself, and he finally reached a point that he was only competing in diving during his two final years of high school. He finished first at sectionals in November at Birmingham Crossplex. 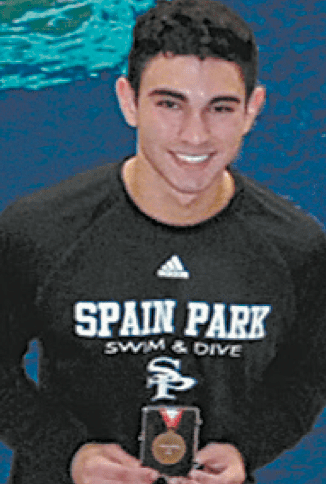 Spain Park only competes in diving at sectionals and state, so his previous experience was at a club level. When state arrived, his knee injury began to trouble him again. Through all of the injuries and all of the sports he has participated in during his high school career, this was his first state championship with any Jaguar team. He’ll have surgery on his ACL this winter. The potential back surgery involves risks, and he will be evaluating those over the next few months. El-Fallah said he will enroll at Alabama this fall. He’s spoken to Chuck Wade about joining Alabama’s diving team, but his inexperience at tower diving will likely keep him from immediate participation. He does expect to compete at the intramural level while he pursues a degree in chemical engineering on a pre-med track.